Couvré Scalp Concealing Lotion makes hair look instantly thicker by eliminating the contrast between thinning hair and scalp. This waterproof formula with natural pigments conceals the scalp, resulting in hair that looks fuller and thicker. It provides long-lasting, subtle color that doesn’t rub off or stain. One tube can last between 3 to 4 months and this scalp concealer can be applied to either damp or dry hair. Wash and towel dry hair. Couvré works best on damp hair. Wet the sponge applicator and squeeze out the excess water. Apply Couvré on to the sponge directly from the tube and spread it evenly. Comb hair away from thinning area. Dab Couvré with the sponge on the thin areas of the scalp. Rub firmly and blend into surrounding hair for natural appearance. Style your hair as usual, using comb, brush or blow drier. Couvré resists water, but removes with normal shampoo. 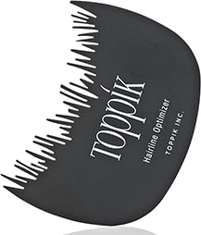 For the best smudge-free results apply Toppik Fiberhold Spray to scalp and surrounding hair. Couvré contains no dyes, and cannot clog pores. Use daily for best results. What is Couvré Scalp Concealing Loiton made of? – Couvré is made with sesame seed oil (a natural moisturizer) and iron oxides, which are natural colorants. If it begins to rain, will Couvré come off? – Couvré stays firmly in place through wind, rain and sweat. Does Couvré affect hair growth? – Couvré does not encourage or discourage hair growth. Its gentle formula cannot clog pores or affect your scalp condition. How long does it stay in the hair? – Couvré stays on until it is shampooed out. How do I remove Couvré Scalp Concealing Lotion? – It removes easily with shampoo. Can I swim with Couvré scalp concealing lotion? – Yes. It’s completely waterproof. Is Couvré safe with color-treated hair?